. Published on Thursday, June 16, 2016 . Summer is the time for great exploration—whether it be in the form of scoping out the best beaches, taking on new hobbies due to newfound free time or most importantly, trying new cuisines that would otherwise be outside of your comfort zones. As a Chinese-American who has spent more than 10 years of her childhood in the city of Rosemead, California – a predominantly Asian community in the San Gabriel Valley filled with an abundance of Asian culture and cuisine – many of my family get-togethers took place within the walls of Asian hole-in-the-wall restaurants that may have lacked the palpable cleanliness of the local Denny’s, but was nonetheless filled with plenty of color and flavor—both in food and local characters. Because of these factors, I’d consider myself a walking Zagat guide of the best Asian eats. A true Chinese staple, dim sum is the Asian equivalent of brunch in American culture. Only, mimosas will be replaced with hot tea and smoked-salmon Benedict will be replaced with a variety of dumplings, egg tarts and buns. Step away from the confines of traditional options and go for the steamed chicken feet prepared with black bean sauce. While the name and sight of it may be intimidating at best, your taste buds will ultimately thank you. Not your typical dim sum joint and a bit pricier than most, but the food is unparalleled; bonus: you’re not chasing down servers with carts; you check off the items you want from a handy little list equipped with pictures and the food is brought right to your table. It’s a lazy person’s dream! A closer alternative to campus, this location involves the traditional metal food carts being pushed around so the struggle may be a bit real if you’re a newbie to the dim sum scene and aren’t quite sure what everything’s called. Locations also available in the San Gabriel Valley. A great alternative for pho during these hotter months, vermicelli is a Vietnamese dish composed of rice noodles; vegetables such as cucumber, carrots and lettuce; crushed peanuts; egg rolls and your choice of (or lack of) meat tossed together with fish sauce for taste. While fish sauce may sound off-putting, it’s a delicious staple of Asian cuisine—one that’ll give you horrendous fish-sauce breath, so pop a mint or two after your meal. One of the oldest and most popular eateries in the area, this Zagat-rated joint often accommodates long wait times but still, its inexpensive prices and flavor can’t be beat. Note: restaurant isn’t open on Wednesdays. While the name may be difficult to pronounce, one thing is perfectly clear to articulate: love songs could be written about the food here, which boasts an obscenely inexpensive price range. The broken rice dishes—which, unlike most places, doesn’t skimp on the items and really stacks them on—will also make you cry tears of joy. 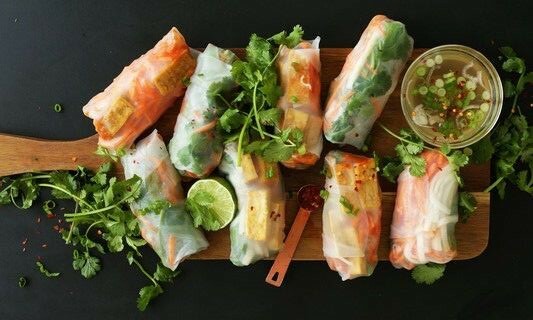 With the word summer itself in the name, summer rolls are a fresh, Vietnamese must-have during the warmer weather. Summer rolls generally consist of rice noodles, vegetables, herbs like green onion or cilantro and your choice of meat or shrimp-or lack thereof-rolled into place with transparent rice paper. Summer rolls can be dipped in fish sauce or peanut sauce. Grab yourself a banh mi sandwich while you’re at it. While the buy-three get-one-free deals for the boba drinks may appear enticing, I’d steer clear of those—they taste like feet. The name speaks for itself. If you’d like to avoid fish-sauce breath, a great alternative (and personal favorite) is peanut sauce. No, it isn’t peanut butter. Lacking the appearance of a traditional salad, papaya salad is a Thai dish composed of shredded raw papaya, tomatoes and occasionally, Chinese green beans mixed with fish sauce and lots and lots of chili spices. Its spicy flavor, accompanied with a hint of sourness from the lime, is often eaten with cabbage or pork rinds. It can be served with crushed peanuts and dried shrimp or, if you’re feeling adventurous, with blue crab. Despite living about 45 minutes away from this little gem located off Hollywood Boulevard, I’ve somehow managed to become a regular among the lovely waitresses. “Yeah, my mom’s doing great—could I get my fifth Thai tea refill, please?” The only downside: the restaurant is cash only and you need to pay $2 for parking to park in their tiny validated lot. A Japanese cold noodle made with buckwheat flower and green tea leaves, cha soba noodles make for a refreshingly cool meal during those hot summer days. Served cold with condiments in the likes of dipping sauce, sesame seeds and green onion, take it upon yourselves to order these fresh noodles to accompany your unagi rolls. Once also located in Rowland Heights, and holding a dear place in my heart due to my weekly lunch visits with a friend following class at Mt. SAC during our community college days, the inexpensive prices and flavor can’t be beat. While the already-closed Rowland Heights location was far superior to Alhambra’s, it still makes for a good alternative. Which one of these options will you be trying this summer? Tell us some of your must-have cuisines during the summer season! Share with us using the hashtag #CampusCropChat on Facebook, Twitter or Instagram, and be sure to follow us on Snapchat @ASICPP.